Visit the best of Northern Europe using one rail pass. The easiest and arguably most beautiful way to explore Scandinavia. 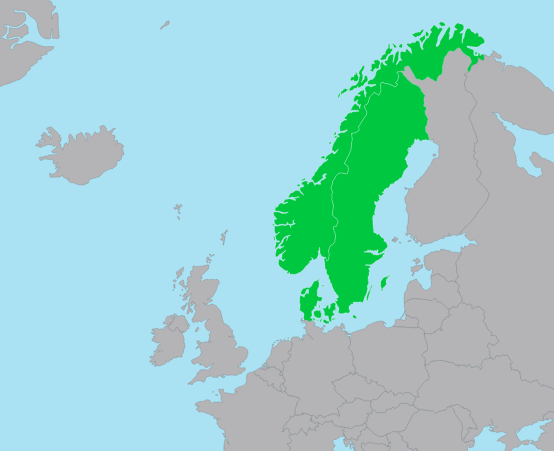 In general, and for this blog post, Scandinavia is just Denmark, Sweden and Norway - Scandinavia is a subset of the Nordic countries (aka Denmark, Sweden, Norway, Iceland and Finland). But we're not going to talk about Iceland and Finland here. The easiest and best way to travel Scandinavia by train is by using an Interrail pass (for Europeans) or an Eurail pass (for non-Europeans). I wrote about train travel in Hungary with Interrail, which tells you about the different passes, whether it's worth it, explains reservations etc. This is your essential Scandinavia rail itinerary, it can of course be explored backwards depending where you're arriving into Scandinavia from (if you're coming from Northern Germany you'll probably start with Denmark; and if you're coming from the UK you'll probably start with Norway etc but there's no specific order you have to do them in). You can of course add extra steps along the way - explore Kronberg and Aarhus in Denmark, hop over to Gothenburg in Sweden or even try and find Santa and reindeers in Northern Norway and Sweden. Christiania is an anarchist district. It's kind of like the Amsterdam section of Copenhagen: there's graffiti, tourists, homeless people, souvenirs and over-priced weed. I liked it. The Little Mermaid Statue is arguably the most famous landmark in Copenhagen. The artist was inspired by the Little Mermaid fairytale by Hans Christian Andersen - who was Danish. Nyhavn is a 17th century canal district and our favourite spot in Copenhagen - the colourful buildings are just so damn pretty and make for perfect Instagram shots. We stayed at the Copenhagen Ibsens Hotel and thought it was great - they offer free happy hour and their staff are so nice and funny - some of the nicest we've ever met actually. Check out our full review or go ahead and book your stay at Ibsens Hotel. The Old Town of Stockholm was built around 1000 CE by Vikings, nowadays Stockholm is the capital of Sweden. Embrace the coldness and get a cool drink at an Ice Bar. Stockholm looks great from up high. Right next to the hotel Hobo is a roof-top bar that offers perfect views of Stockholm. Like Nyhavn, Stortorget is the place to go if you want an Insta-good photo of some cute houses. Stortorget is actually a small square in the middle of Old Town. We stayed at Hobo and At Six when we were in Stockholm and loved both of them. They are two very differently styled hotels in the same great location. Hobo is more ikeary and hipstery, At Six is sexier and more elegant. We slept really well at both of them, but At Six gets a special mention for it's breakfast which was the best we had in Scandinavia. It was so good. Seriously, I'd go back just for the breakfast. Oslo was founded around 1049 by the last Great Viking King. Nowadays Oslo is the capital of Norway. Eat your heart out Sydney, there's a new Opera House in town (well in Oslo), and it's super cool - you can walk on top of it for the best views in Oslo. Oslo has an abundance of cool museums and quirky art galleries (and is the current home of the scream)! We recommend getting your hands on an Oslo Pass - it's the easiest and cheapest way to explore all of them, and includes public transport too. We stayed at the Clarion Collection and absolutely loved it - they offer a daily complimentary dinner (and breakfast too of course). And this wasn't just any free dinner, it was an incredible spread with lots of options for all types. Check out our full review or go ahead and book your stay now. Last but not least Bergen - the perfect spot for fjord spotting. Bergen is surrounded by fjords including Norway's biggest fjord: Sognefjord. The fjords and the mountains make Bergen the best place to hike. But it's not all fjords and mountains, like Copenhagen and Stockholm, Bergen has it's own colourful houses: Bryggen. Villa Charlotte is a 5-star place to stay in Bergen with very good reviews. This place features saunas, pools, balconies and all the other luxuries you can imagine. Scandinavia is the perfect place to go Interrailing. The views from the train window are absolutely incredible and something you're not going to forget any time soon. Scandinavia is a really safe, fun place to travel to and is beautiful in both winter and summer. Let us know what you'd like to add to this list!